Artist David Kamm: “End of the Rainbow” was created in response to the 2012 shootings at Sandy Hook Elementary School. A long series of related work has followed. Sadly, gun violence never goes out of style in America. Poet Melissa Fite Johnson: I was so struck by David’s piece. The ways gun violence affects children is something I think about often. Every day, really—I’m a high school English teacher, my husband is an elementary school teacher. Schools should be safe places, and they aren’t anymore. David’s piece stirred up old fears and memories—my poem is based on a true story, though I changed the name of my childhood neighbor. 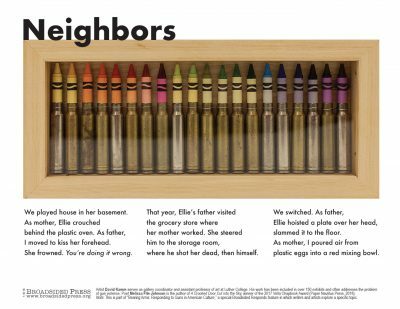 Artist David Kamm: I was surprised to see that Melissa wrote her poem from a child’s point of view, or as someone looking back on a childhood memory, with a matter-of-fact response to tragedy that children sometimes exhibit. I was also surprised by the title of her poem, which not only refers to the literal proximity of playmates, but also suggests the interrelationships we share with others. Artist David Kamm: Some work is a punch in the mouth and other work whispers in your ear. In either case, the most successful occasional or political work probably doesn’t simply report or reflect real-world events, but generates a sense of empathy or concern for our collective well-being. Poet Melissa Fite Johnson: I think the most effective occasional and political poems feel honest and avoid preaching or unearned sentimentality. They make readers consider their own lives, because the personal is absolutely political. Artist David Kamm: Maybe the song of a morning dove at dusk. Artist David Kamm: I just finished reading The Dive from Clausen’s Pier by Ann Packer, which was written in a way that actually made me care about the characters. Poet Melissa Fite Johnson: I finally read Maggie Smith’s latest collection, Good Bones. That, and Shuly Cawood’s memoir The Going and Good-bye, are both vulnerable and brave and just so beautifully written. Artist David Kamm: Envisioned Worlds: Lithographs from the Hokes Archives by Beauvais Lyons. Beauvais’s work is conceptually engaging and beautifully executed. Artist David Kamm: Two things come to mind. First, “End of the Rainbow” is not “anti-gun,” but rather anti-violence. Second, a colleague once asked if I ever made anything “happy.” I don’t believe my work wallows in tragedy, but rather is rooted in a deep optimism that things can get better if we honestly address the issues. Poet Melissa Fite Johnson: It’s strange when a poem or piece of art springs from tragedy. I worry about coming across as exploitative. Ultimately, though, I think art helps us heal, helps us remember our humanity. At least, that’s what it aspires to do. David Kamm earned an MFA from the University of Iowa. For 28 years he has served as gallery coordinator and assistant professor of art at Luther College. His work has been included in over 150 exhibits, and for several years has addressed the problem of gun violence. Image: “End of the Rainbow” 5″x12″x1″, mixed media. Melissa Fite Johnson is the author of While the Kettle’s On (Little Balkans Press, 2015), a Kansas Notable Book, and A Crooked Door Cut into the Sky, winner of the 2017 Vella Chapbook Award (Paper Nautilus Press, 2018). Her poems appear in Rattle, Valparaiso Poetry Review, Rust + Moth, and elsewhere. 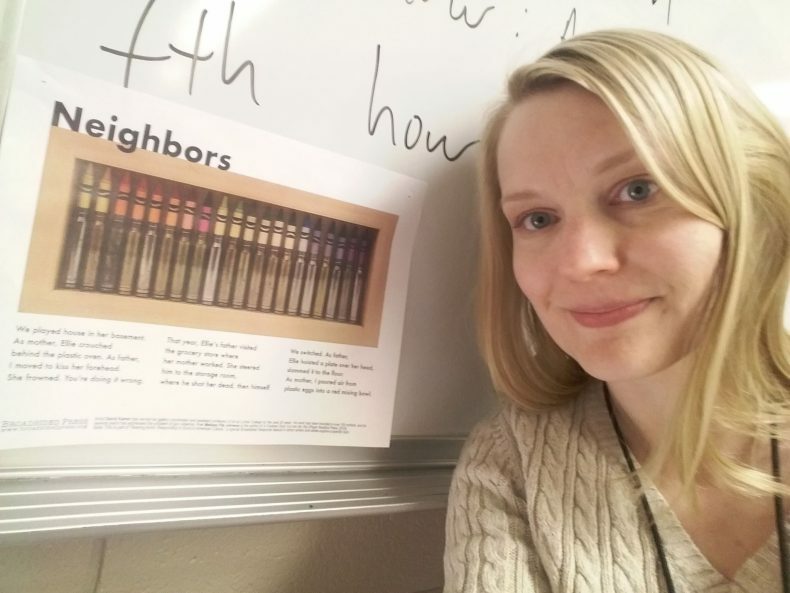 Melissa and her husband live with their dogs and chickens in Kansas, where she teaches English. For more, visit melissafitejohnson.com. 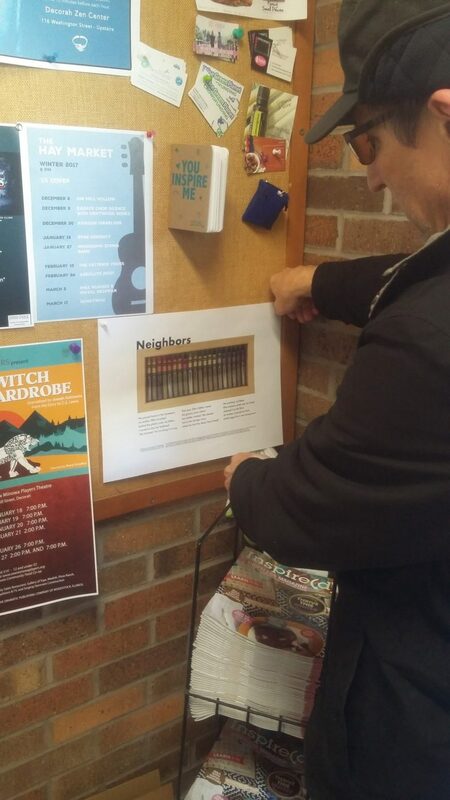 David Kamm Vectorizes on a community bulletin board in downtown Decorah, Iowa.